DIY History | Transcribe | Social Justice | RILEEH, ca. 1966 | 1966-04-01 Daily Iowan Article: ""Iowa, Rust College Ties Tighten""
1966-04-01 Daily Iowan Article: ""Iowa, Rust College Ties Tighten""
Iowa, Rust College Ties Tighten By DALLAS MILLER Managing Editor The tie that bands the University of Iowa and Rust College in Holy Springs, Miss., is becoming stronger everyday through the efforts of faculty and student volunteers from both schools. Iowa and her sister college Rust, are continuing a program for inter-institutional cooperation that began in1963. Two members of the Rust staff, Dean W. A. McMillan and Public Relations Director Eddie Smith, spent Thursday here confer with University personnel. 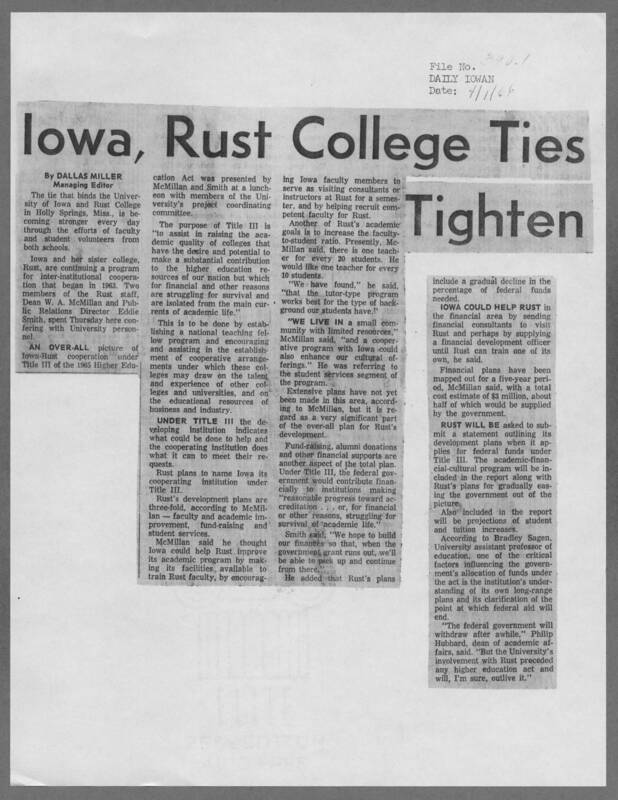 An over-all picture of Iowa-Rust cooperation under Title III of the 1965 Higher Education Act was presented by McMillan and Smith at a luncheon with members of the University's project coordinating committee. The purpose o the Title III is "to assist in raising the academic quality of colleges that have the desire and potential to make a substantial contribution to the higher education resources of our nation but which for financial and other reasons are struggling for survival and are isolated from the main currents of academic life." This is done by establishing a national teaching fellow program and encouraging and assisting in the establishment of cooperative arrangements under which these colleges may draw talent and experience of other colleges and universities, and on the educational resources of business and industry. UNDER TITLE III the developing institution indicates what could be done to help their requests. Rust plans to name Iowa its cooperating institution under Title III. Rust's developing plans are three-fold, according to McMillan- faculty and academic improvement, fund-raising and student services. McMillan said he thought Iowa could help Rust improve its academic program by masking its facilities available to train Rust faculty, by encouraging Iowa faculty members to serve as visiting consultants or instructors at Rust for a semester, and by helping recruit competent faculty for Rust. Another of Rust 's academic goals is to increase the faculty-to-student ratio. Presently, McMillan said, there is one teacher for every 20 students. He would like one teacher for every 10 students. "We have found," he said, "that the tutor-type program works best for the type of background our students have." "WE LIVE IN a small community with limited resources," McMillan said, "and a cooperative program with Iowa could also enhance our cultural offerings." He was referring to the student service segment of the program. Extensive plans have not yet been made in this area, according to McMillan, but it is regard as a very significant part of the over-all plan for Rust's development. Fund-raising, alumni donations and other financial supports are another aspect of the total plan. Under Title III, the federal government would contribute financially to institutions making "reasonable progress toward accreditation . . . or, struggling for survival of academic life." Smith said, "We hope to build or finances so that, when the government grant runs out, we'll be able to pick up and continue from there." He added that Rust's plans include a gradual decline in the percentage of the federal funds needed. IOWA COULD HELP RUST in the financial area by sending financial consultants to visit Rust and perhaps by supplying a financial development officer until Rust can train one of its own, he said. Financial plans have been mapped out for a five-year period,, McMillan said, with a total cost estaminet of $3 million, about half of which would be supplied by the government. RUST WILL BE asking to submit a settlement outlining its development plan when it applies for federal funds under Title III. The academic -financial-cultural program will be included in the report along with Rust's plans for gradually easing the government out of the picture. Also included in the report will be projections of the student and tuition increases. According to Bradley Sagen, University assistant professor of education, one of the critical factors influencing the government's allocation of funds under the act is the institution's understanding of its own long-range plan and its clarification of the point at which federal aid will end. "The federal government will withdraw after a while," Phillip Hubbard, dean of academic affairs, said. "But the University's involvement with Rust preceded any higher education act and will, I'm sure, outlive it."